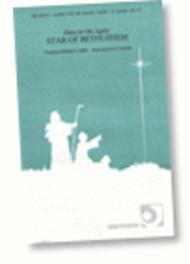 Shine for Me Again: Star of Bethlehem composed by Dan Carter. For SATB choir. Christmas. Medium / Medium-Difficult (accompaniment). Octavo. Duration 3:00. Published by Praiseworthy (JK.00159).Christmas song as told by a shepherd boy. The star guided him to Bethlehem and now he remembers the light of that star. His testimony of Christ lives on. This song is also included in Dan Carter's Cantata "Shine for Me Again: Star of Bethlehem" (#00475). The arrangement in the cantata is different from this one. It is also available as a solo (#00160).